When it comes to social media faux pas, following a fan account for your new husband's ex girlfriend has to be fairly high on the list. Hailey Baldwin just found that out the hard way. It all started approximately ten hours ago when an account with the handle @houseofsel posted a picture of a notification that Hailey Baldwin was a new follower, which is like LOL. "Omfg hailey appareantly followed me and unfollowed lmaoooo whaaaat??" the caption read. But then, the account posted this picture that same hour, with a caption that appeared to be in response to a wave of DMs. "to people who dmed me about it, NO i dont hate hailey and i never did. i dislike jailey THE RELATIONSHIP ITSELF because as i said the whole thing seems fake to me cause i just dont understand what happend." The writer said that Hailey following and unfollowing her was a "weird flex but ok," which is the perfect use of that phrase. Approximately one hour later, the account posted this very incriminating (and very fishy) screenshot, in which Hailey basically admitted that she did it via a DM. 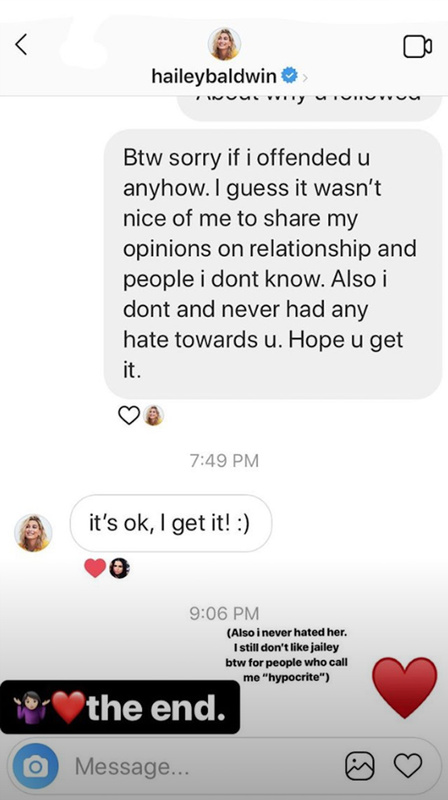 Now, there's no way to tell whether this screenshot is real or fake, but if it's real, it's pretty weird for Hailey to apologize for following a Selena Gomez fan account right? Why would she do that? IDK. Either way, the whole thing is hilarious.